Congratulations to "Cris", the winner of Mallory's giveaway. Thank you to all who participated. hoard: [hawrd, hohrd] to accumulate for preservation, future use, etc., in a hidden or carefully guarded place. to hoard food during a shortage. Did you ever just want to take a great big contractor-sized trash bag through your house and throw 90% of everything you see into it, drag it out to the curb and say 'good riddance?' That's how I'm feeling today. I'm having my master bedroom closets (circa 1950s) remodeled into one big walk-in closet. Of course, before we could get started on the remodel, everything in the closet had to come out. It was like watching clowns climb out of a tiny car at the Circus, or seeing a magician pulling rabbits, doves and pretty girls out of a hat. I cannot believe the volume of clothes, shoes, suitcases and cat toys came out of those two small spaces. Let me put it this way. What came out of there takes up half of my office, waist-high. It doesn't help that my husband still has shirts with his name sewn in them by his mom from high school, the first (and every) pair of glasses he ever owned, a pair of hiking boots--'still perfectly good' (his words) from 1972 and a wool sweater he accidentally dried in the dryer that's too small for our cat. I save things too, but mine are only the really, really, ultra-important things--like every book I ever bought, or every piece of wrapping paper I ever (carefully) tore off a gift. I need those things. I've filled up a couple of contractor-sized trash bags already, just of my own stuff. Some is being donated and some is going to the curb. And I have a tentative promise from my husband that he will 'go through' his clothes before they go back into the newly remodeled closet. To give credit where it's due, neither one of us hides our stuff. Nope. In our house it's right out there in the open where anyone visiting us can see it. Any time. All of it. Disclaimer: these photos are not of my actual cat or my actual bookshelves. 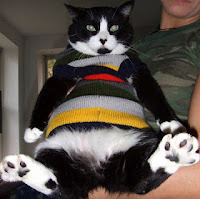 To be honest, we have at least twice that many books, and my cats want to tell you that not one of them is as fat as the adorable kittie in the picture. So what do you have that you are most certainly not hoarding? Books, like me? Clothes? Shoes? Coupons without expiration dates from back when DREFT and IVORY SNOW were still being made? (Ahem, ignore that.) I'd love to hear from you. My husband wants to call the Hoarder show because I have so many books. Now, I can tell him I am not a hoarder! Oh yes, books is a big one. Also information on writing. I really have to go through it all & get rid of some! Tammy and Janet, exactly! You are so not hoarders. I shouldn't have even mentioned books. Collecting books is definitely not hoarding. In fact, I think collecting books is actually good for us. Better than yoga or low-fat mayonnaise. Which brings up another subject. Isn't "low-fat mayonnaise" an oxymoron? I have tons of fabric too, TrishJ. My mother collected it for making quilts. She did make a couple. Those wedding gifts in the back of the closet, Karen B? You might want to take a look at them. When we moved a couple of years ago, I found a stack of brand new towels I'd forgotten about! Back to filling up that trash bag, then I've got to write for a while! I keep most of the books I buy. I like to keep track of what I have so I do not get duplicates. I also enjoy rereading my favs. I need more book shelves... LOL! Now my youngest sister... wow, you should see all of her stuff... it has taken over 3 closets in the house and her room! I'm a book hoarder, too - if you consider seven 6 ft (full) bookcases hoarding! Not to mention the e-books I have on my Nook and Kindle. I also have tubs full of clothes in various sizes - 'cause who knows, I might fit into them again when I gain/lose weight! When we sold the family home, we went from ten rooms down to four. The most painful part of the move was having to go through my book collection. The books were donated to the library and local charities - 40 plus moving size boxes. Print books are beginning to take over again and I don't want to think about the number of books on my Nook. There are three other things that I hoard beside books. They are CDs, DVDs, and those darn receipts that I have to keep to back up my taxes just in case I get audit by the IRS. I've spent most of my life moving around, so I've gotten pretty good at not being sentimental and accumulating only the basics at each stop. During university, the first question before I purchased anything for my room was "where am I going to store it over summer, and what am I going to do with it once I graduate?". My entire 4 years fit into 4 packing boxes (full of books, class notes, etc.) and a suitcase full of clothes that were shipped straight to my next destination! Of course, I've now been in graduate school in the same flat for 5 years and have accumulated more things. Mostly books. And videogames, And scuba gear. Thankfully, I also have digital copies of most of those books, so they'll be donated when it's time to move on! I think I'm shopping receipts hoarder, I don't even know why I'm doing that. I just can't throw away those papers and I usually keep it in shoe boxes. LOL. 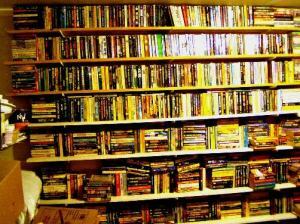 I used to be a book hoarder until closets and bookshelves, plus more closets and bookshelves were overflowing. So last year I donated fourteen large boxes full of books to the local library and a nursing home in our area. I still have several bookcases full but just couldn't part with those beloved and select titles. My family recently moved. If I wasn't convinced to throw stuff out before, I am now. Never again do I want to move that much stuff. Books, clothes, wrapping paper & ribbons, material, wool (basically a cupboard full of craft STUFF). It's all **good**. While books aren't as portable as say... shot glasses :) I think it's wonderful to see so many people who treat books as the precious and rare resource they are. My mother was a librarian, and she taught me that each and every book is a invaluable gift. I remember her saying "We don't treat books that way," if I'd turned down a page as a bookmark or if I'd laid an open book face down.